Yahoo! 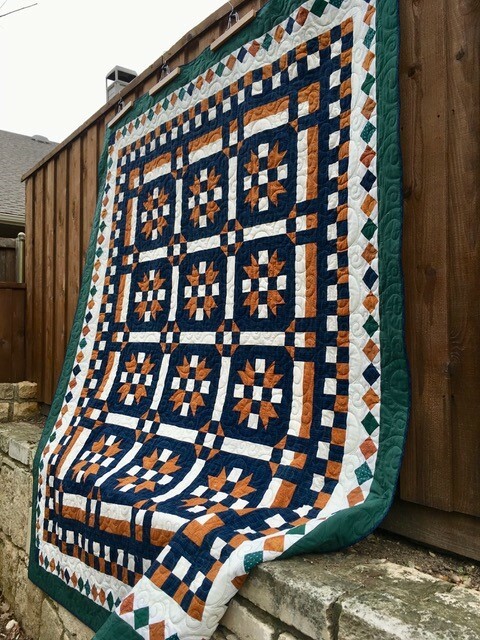 There is a charity quilt finish. This is from Christine P and Cheryl. Christine P. sent this beautiful quilt top to me, and I forwarded it to Cheryl in Dallas for quilting and binding. 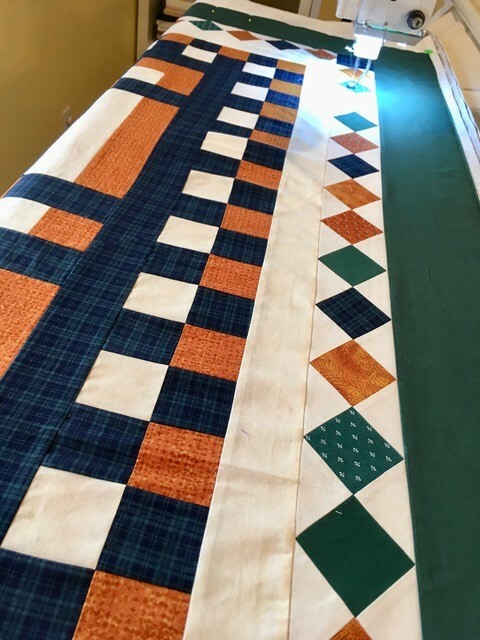 Christine P. used three fabrics for this quilt top: a traditional plaid, an orange-brown weave, and solid off-white. What a nice job Christine P. did on these blocks. Does the plaid remind anyone of parochial school uniforms? How about that burnt orange — any University of Texas Longhorn fans thinking about their school colors? 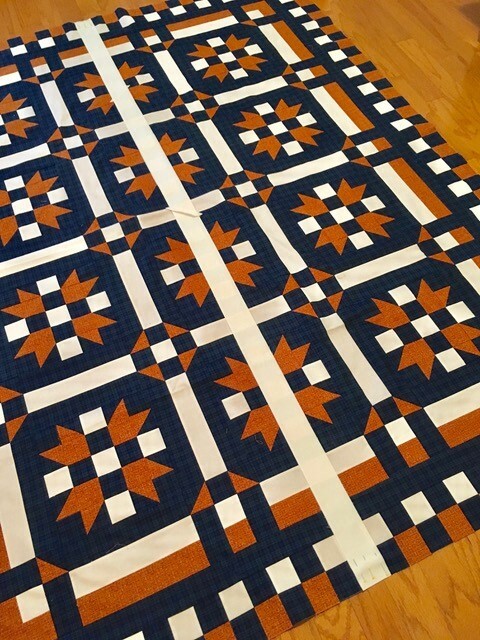 The quilt top is made entirely of 2 1/2” strips and squares. But that doesn’t mean it’s boring. Look at this fabulous design. Oooo la la! 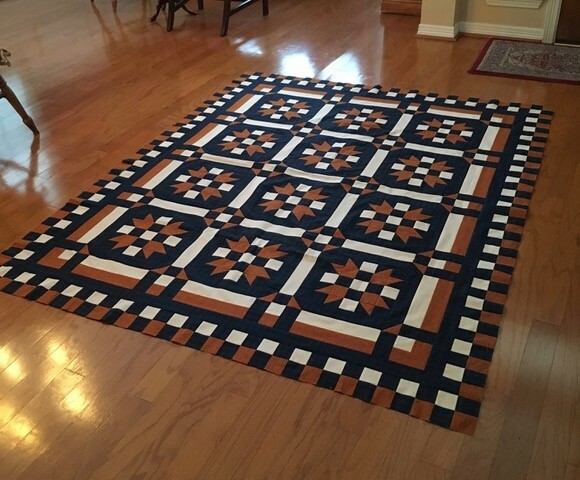 Christine P.’s quilt top was 68 inches x 84 inches. This one is destined for the House of Hope where the ladies have twin-size beds, so it needs to be a bit longer. The women take their quilts with them when they graduate from the program and their future beds might be of any size, so bigger is better. 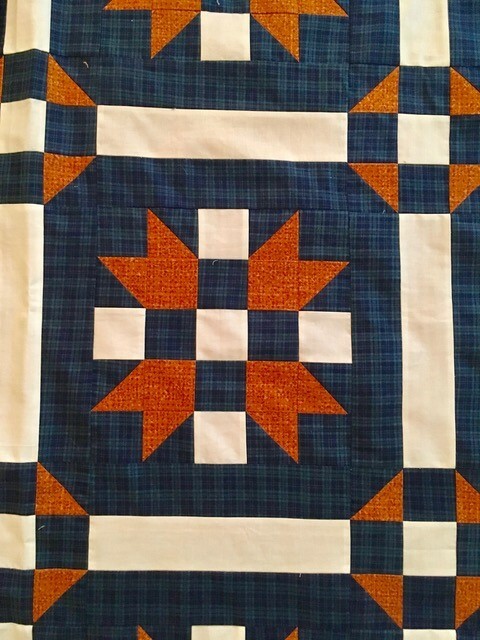 Cheryl in Dallas added three borders to increase the size of the quilt. 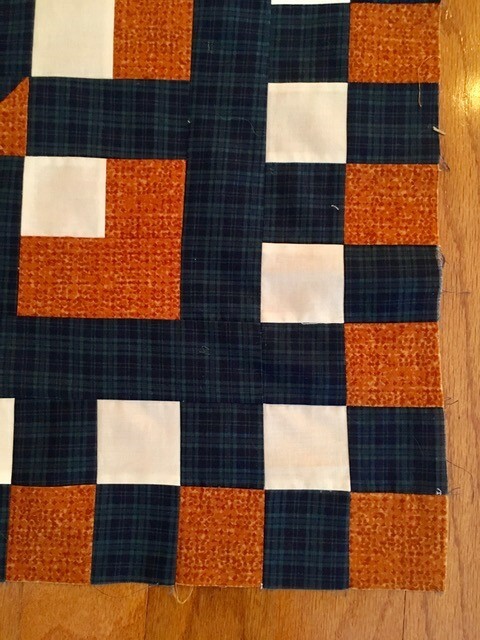 The second border was made with 2 1/2” squares set on the diagonal. Cheryl dug through her fat quarters and found some that reasonably matched the colors of the quilt top. More or less. The third and outermost border is solid hunter green. Navy blue would have been more consistent with Christine P.’s fabrics, but there was no navy blue in a certain quilt stash in Dallas. The result looks great, don’t you think? The quilt finished at 82 inches x 97 inches. Plenty big enough to be used as a bedspread on a twin-size bed. The digital quilting pattern is called “Threadz,” designed by Patricia Ritter. 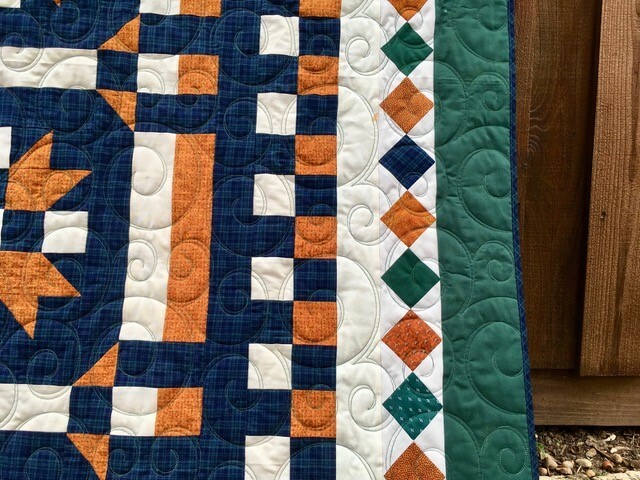 Lots of loopeys and swirls contrast with the straight lines and diagonals of the quilt design. 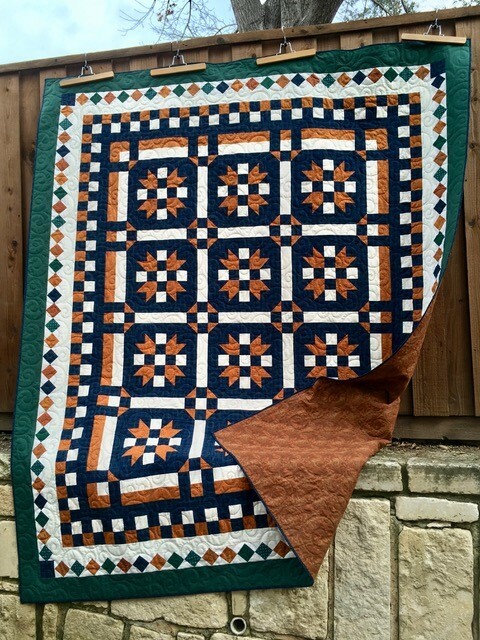 I donated the wide quilt backing two months ago, not knowing that it would be used on a University of Texas burnt orange quilt in the future. Perfect match! 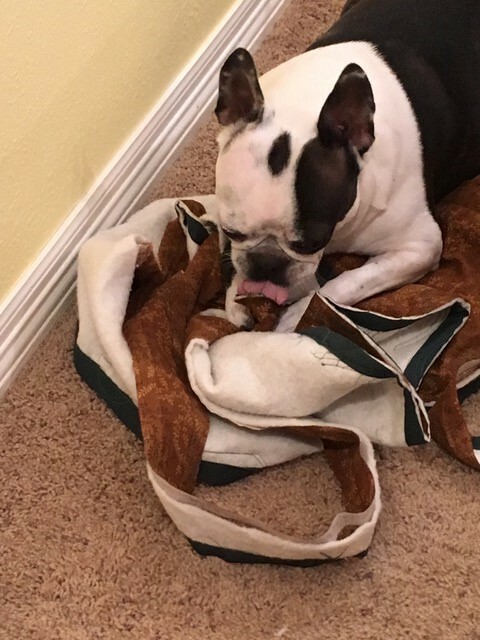 Libe the Boston Terrier gets to practice with the backing and batting that were trimmed from the quilt. Everyone is happy with this project. Christine P.’s quilt will go to the House of Hope in Gainesville, Florida. Three new residents just arrived at the House of Hope in January. Thanks to donations from blog readers, Cheryl had two quilts all ready to go. This plaid beauty will be the third quilt for the FedEx delivery to Florida this week. Most of the participants in the House of Hope program come directly from jail. They appreciate the donated clothes and food, but a brand new quilt handmade just for them is a VERY special treat! Thanks Christine P., Cheryl in Dallas, and all of you blog readers who donate tops and other goods to create heirlooms for people who have so little. I appreciate all of you! 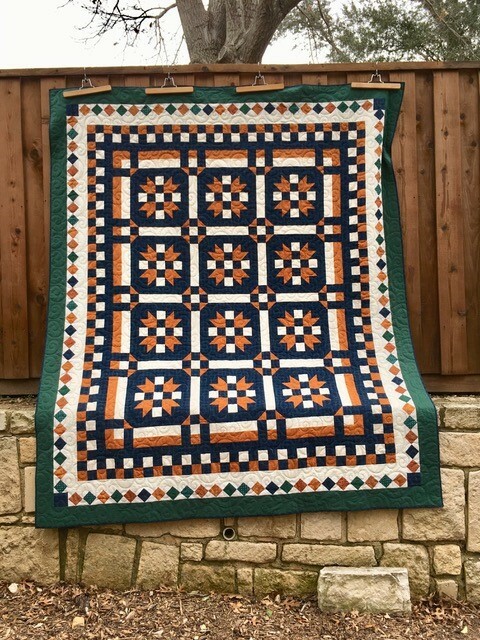 This entry was posted in Charity Quilts on February 1, 2018 by Jo. What a beauty, nice job ladies. for the House of Hope. The ladies will love them. Your quilts are always beautiful. That plaid and burnt orange go very well together! I would never have thought of it! This was a fun top to quilt, and Christine P. did such a great job on it. Joyce, I am so glad you told us you are the designer. I checked out your website and the free patterns you offer. I would not have recognized Christine P’s top as your “Be Mine” design. That just shows what happens with a different color palette. I particularly like your pink and red and white version. Now I’m imagining a super scrappy version of Be Mine” because I have TONS of 2 1/2 inch strips and squares. Cheryl did a fabulous job adding the additional borders…the diamonds in the border pulled in the green in the outer border and makes it look as though it was planned that way!! Love it!!! Love it without and with the borders. Thanks to you for sharing and to Joyce for letting all of us know about her pattern and website.